Queens and Inverness shared the points and the goals as this afternoons Championship clash produced a very eventful and very entertaining game that both teams will remember for differing reasons. For Queens it will be a frustrating memory as for the opening hour they played some of their best football of the season as they raced into a 3 goal lead and appeared to be on the way to ending the long unbeaten run that Inverness had established, and for the visitors, they would have been delighted at the way they recovered from the deficit to continue with their fantastic unbeaten league. For the neutral, a draw was probably about the right result as although both teams scored three times, there were also many more opportunities for both teams to add to the scoreline. Queens made two changes to the team that drew at Ayr last weekend, goalkeeper Alan Martin missed out giving a first league start of the season to Jack Leighfield, and Andy Stirling started ahead of David Norman who dropped to the bench, and for the visitors there was to be no quick return to Palmerston for former Queens man, Shaun Rooney, who missed out due to injury. Queens began in a 4-4-2 formation, and started well launching a quick attack down the right in the opening minute. 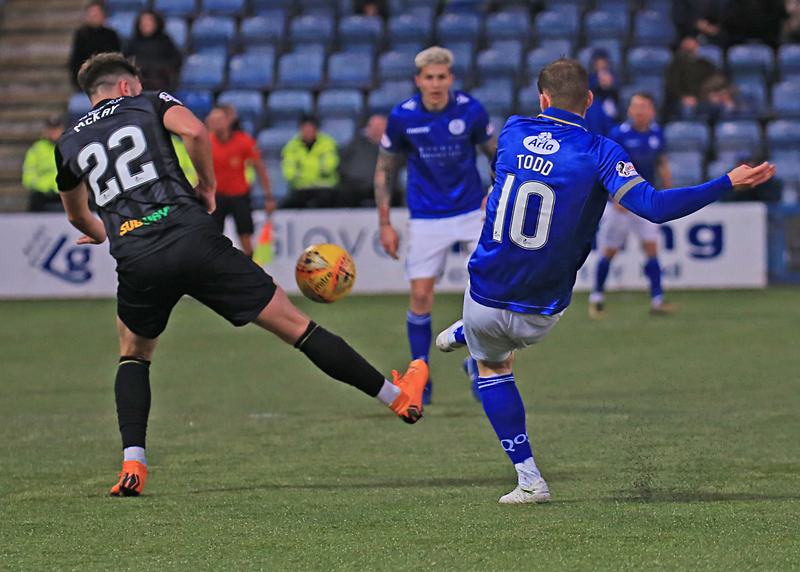 Andy Stirling found Stephen Dobbie on the right and his first time cross in behind the visitors defence was only just too far ahead of the arriving Josh Todd. That early promise from Queens continued, and with just 5 minutes gone they carved out a really good chance to open the scoring.Once again the attack stemmed from the right hand side where the pace of Stirling allowed him to work the space to pick out a cross, and when his pass picked out Lyndon Dykes, the striker was very unfortunate to see his low shot shave the outside of the post as it just slipped wide. The visitors had hardly got out of their own half in the opening stages, and when they did their first half chance fell to Oakley on 14 minutes, but he lacked accuracy with a header that he could only guide wide of the target. 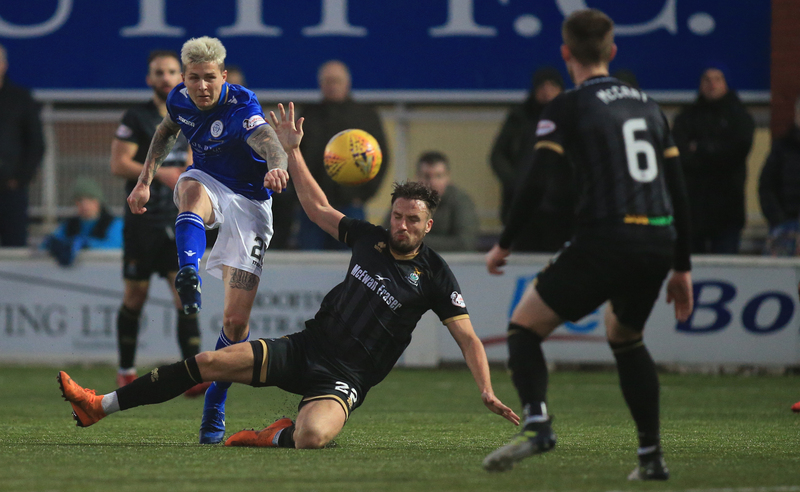 Queens continued to have the upper hand and a trio of corners put pressure on the visiting defence without really threatening to find the breakthrough, although a header from Callum Fordyce from the third corner did at least force Inverness `keeper Ridgers into making his first save of the game. 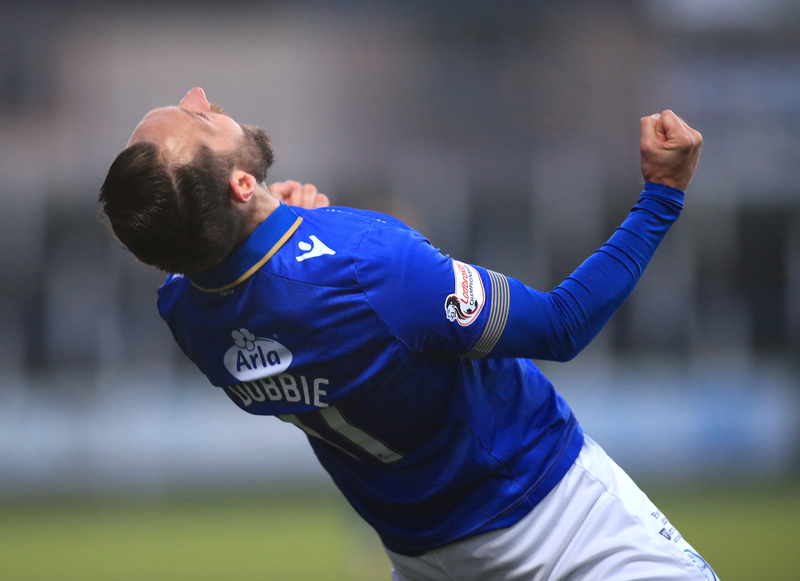 Queens had another opportunity to take the lead on 24 minutes when quick thinking from Gary Harkins saw him pick out Dykes with a long free-kick, but although the ball sat up well enough to be hit, the angle was always against the striker who saw his half-volley fly into the side netting. The home side were well on top and on 31 minutes they took the lead. A flick on from Dykes found Dobbie on the right and his driven ball across the box bounced up and was bundled in by Lyndon Dykes from close range with the Inverness defence and in particular, `keeper Ridgers strongly appealing for handball - an appeal that fell on deaf ears and left Dykes celebrating his first league goal of the season. The goal was a fitting reward for both Queens and Dykes, who in the opening half an hour had linked play very well, and on balance of play, the goal was a fair reflection of the opening half an hours play. Inverness responded well to going behind, and a series of corners were well defended with Fordyce, Harkins, and Callum Semple doing very well to protect young Jack Leighfield and keep the ball away from the aerial threat that the visitors possessed. A decent attempt from Walsh flew wide after Oakley did well to create the chance,but the visitors rarely troubled Leighfield who did not have a save to make in the opening half. A foul by Trafford on Kyle Jacobs saw referee Aitken issue the first yellow card of the game 3 minutes before the break. Queens ended the half with a flurry of half chances, and anyone of them could have added to their lead. Lyndon Dykes saw a flicked header from a Harkins free-kick tipped over, Andy Stirling saw a low drive from the right saved by Ridgers, and Semple came agonisingly close to scoring when his header from a corner just bounced wide. However, Queens had to settle for just the one goal advantage at the break, and although it was only the narrowest of leads, it was certainly a deserved one. As they had done in the first half, Queens began on the front foot and 6 minutes into the half, the lead was extended. 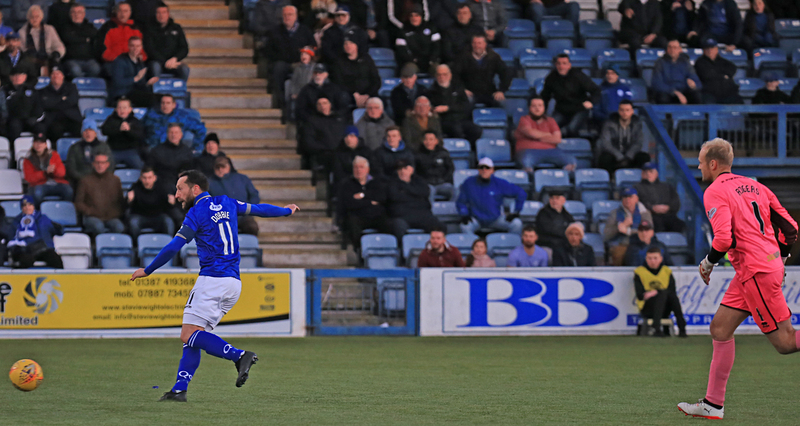 A long clearance was flicked on by Lyndon Dykes and as Ridgers ran from his box in an attempt to clear, Stephen Dobbie got to the ball first, rounded the `keeper and drilled the ball into the unguarded net from just outside the penalty area. It was a perfect start to the half for Queens and for the next 15 minutes or so some of their play was very good. The passing was exceptional, the positional play was excellent and the decision making was also top draw. Dykes almost scored again but try as he might he could just get full control of the ball and his close range effort was bundled to safety. A neat passing move involving Dobbie and Harkins created a chance for Josh Todd, but he sent his effort wide of the target. However, moments later the former Annan man was on the end of a sweeping Queens move that tore Inverness apart and increased Queens grip on the game. Dobbie`s pass picked out the overlapping run of Michael Doyle on the right and his pass across the box found Stirling who initially looked to have lost control, but he was able to work the ball back into the path of Josh Todd who composed himself, picked his spot, and curled a sublime effort into the far right hand corner to make it 3 for Queens. 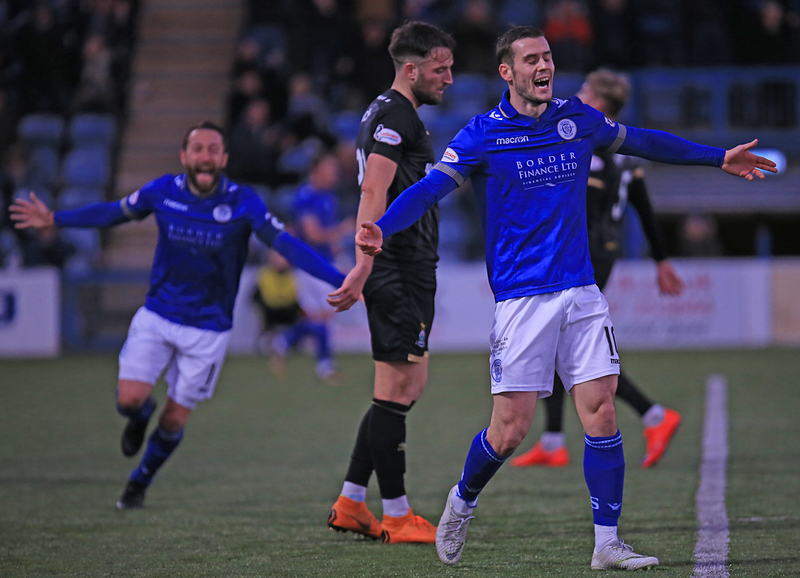 Queens were in total control and were only half an hour away from becoming the first team to record a league win over Inverness this season, and both Jacobs and Dykes had chances to inflict more damage on the stunned visiting defenders as Queens continued to dominate. However on 71 minutes the away side began the fightback when a free -kick from Chalmers was headed in by McCart who jumped above Leighfield to find the net. 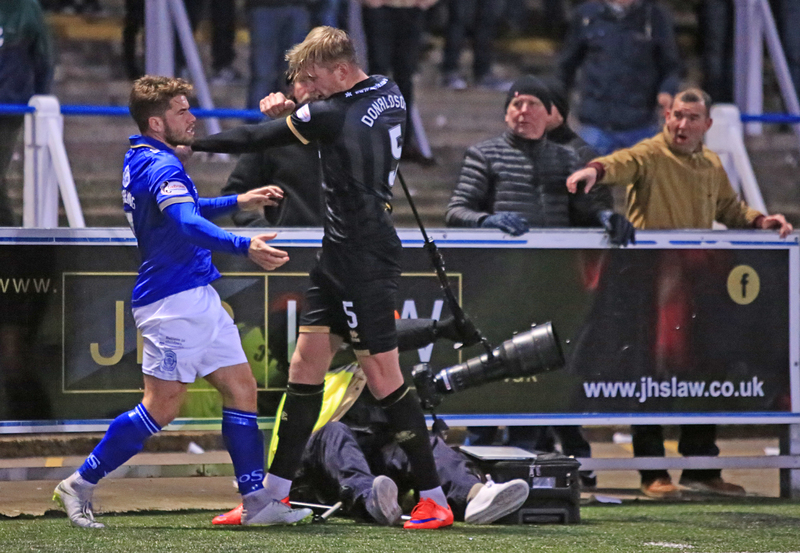 Unbelievably just 3 minutes later the deficit was further reduced when Walsh`s driven cross from the right looked to have flown straight past Leighfield although substitute Austin claimed the goal that really ignited a Caley fightback as they looked to keep their unbeaten run intact. A coming together between Stirling and Donaldson near the bye-line saw both players booked, and from their next attack Queens went close again when Todd`s effort was just tipped over the bar. Having survived that attempt the visitors completed their fightback when a foul in the penalty area gave them a spot- kick that was neatly converted by Welsh. From 3 nil down after 70 minutes, Inverness were now level with 9 minutes to go, and in fact were pushing for a winner. 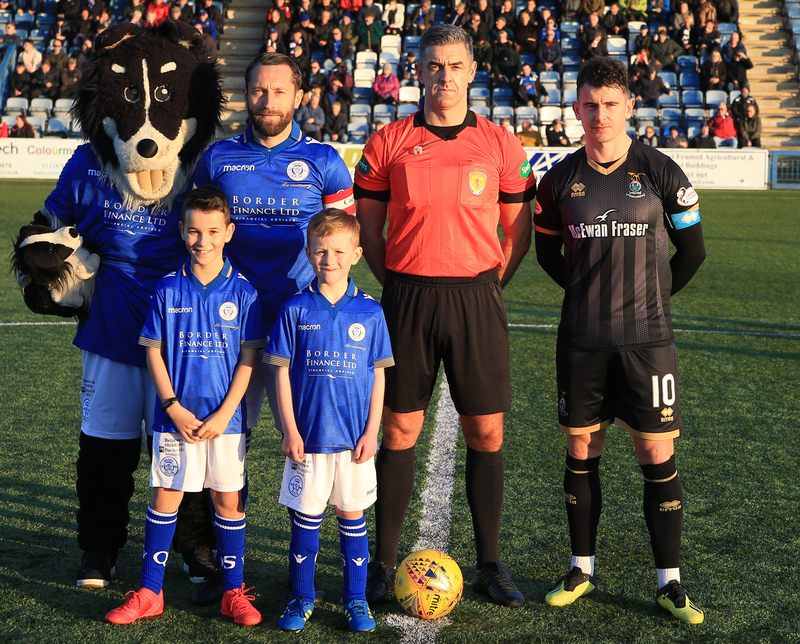 Queens replaced Stirling with David Norman, and then Harkins with Connor Murray, but in the closing moments it took a smart save from Leighfield to preserve the point when he saved well to turn Austin`s close range shot over the bar with his feet. At start of play, a point at home to Inverness would probably have been considered a worthy point, but at 3 nil up with less than 20 minutes left to play, that was certainly 2 points dropped whichever way you look at it. For the first hour we were well worth the lead, but for the final 30 minutes we were as bad as we had been good, although credit to Inverness, as they continued with their incredible unbeaten league run. 14:29 Welcome to Palmerston for the visit of Inverness. Will the visitors long unbeaten run come to an end today? 71 min McCart heads in from a set piece to pull one back.